Below, Gael shares about her farming heroes, the challenges of farming at 70, and what makes Squash Blossom Farm such a special place. How did you choose your farm name? We love to eat squash blossoms and they are loved by honey bees. What do you produce? Do you have a specialty? My specialty is making this small operation as integrated and diverse as possible. If I had to narrow it down I would say: raspberries, bee forage, winter squash and making compost. But I grow a full range of vegetables, herbs, flowers, raspberries, fruit: apples, peaches, pears, plums and cherries; and honey from 3 topbar hives. What are your markets? Neighbors, CSA members and the Taos County Farmers' market. Do you farm full-time? My husband and I are retired professors. He is a full-time potter now and I farm 3 seasons. 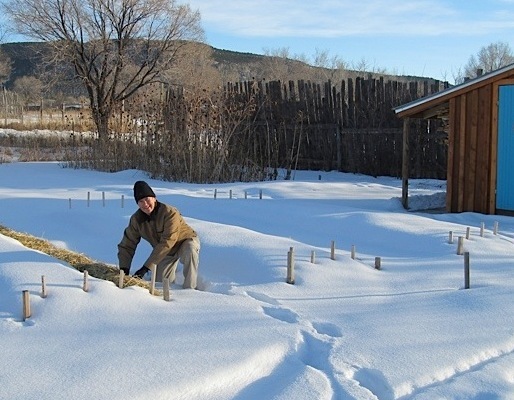 I am a Commissioner on Acequia del Monte (elected and volunteer quite demanding). How long have you been farming? In Taos 13 years. I am 70 years old and have gardened since I was 3. How did you get into farming? Gardening has always been a part of my life and family background. I grew up in rural Vermont hiking, camping, skiing and gardening. I love being outdoors. Professionally, I am an environmental health educator and clinical nutrition educator (2 masters degrees - MSW and MS biology & nutrition – and a doctorate in environmental health science. In 1998, I read Elizabeth Henderson's Sharing the Harvest and was inspired to start a CSA in Stoddard NH. 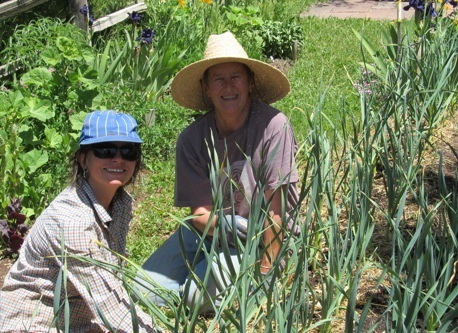 Then in 2001 we retired and moved to Taos and began gardening and started Squash Blossom Farm CSA in 2003. I want to be a farmer for many reasons: I love the work, the challenges, the rewards, the mysteries and the constant learning. I am passionate about the CSA model and want to inspire others to try it especially on a small scale to keep ag land open and productive. The American southwest is an region in a precarious balance with drought and development. I love being part of the effort to restore a local, environmentally sound agriculture. Why did you get involved with CNG? After working with the NM state organic certification process, I became discouraged by the ongoing paperwork and the close affiliation with USDA and corporate agriculture. In 2009 I decided to switch and work with CNG. I believe CNG expresses my value of small local agriculture best and I want to be connected to the global small scale ag community through the Participatory Guaranteed Systems. Talk about a change -big or small- that you made on the farm to address a challenge. The 2 biggest challenges are labor and keeping enough organic matter worked into the hard clay soil. As for the labor, having a cantankerous right hip that needs 1-2 hrs of postural exercises a day to keep me fit and able. Part of the solution is that I spend half my farm income on labor from a wondrous 30 year-old! Regarding organic matter, since I only make about 4 yards of compost, I must buy about 10-15 yards a year. How do you include customers in your farming operation? My customers come to the farm to pick up their share and walk through the beds. They are not interested in working shares but are interested to have me share stories about butterflies, pocket gophers, and what plants are doing well and what might be struggling as the season goes along. What’s your favorite dish to cook at home? Risotto with many variations of vegetables. Favorite vegetable Fennel, carrots, beets, winter squash, broccoli and raspberries! What advice would you give to a farmer just starting out? Give your body plenty of time and ways to restore from hard work. Success depends on being open to learning and enjoying problem solving. Who are your mentors or heroes in the farming world? Wes Jackson, Robyn Van En, Miguel Altieri, Wendy Johnson, the five principal gardeners/bioneers that evolved into Seeds of Change. When have you wished you hadn’t become a farmer? Never! Do you have any hobbies? I play the flute, knit, sew and make beeswax products. Favorite season? I love seasons and all four are favorite. I could not live where there were not 4 seasons. What is unique or unusual about your farm? It is part of 300+ acres historically irrigated from Rio Chiquito and farmed by Hispanic peoples since the early 1600s. My farm is diverse with native shrub hedgerows, small orchard, bees, alfalfa, grasses, native trees and shrubs and flowers. It is alive with native pollinators and small wild animals and for 5 years a flock of native Rio Grande turkeys. What plans or hopes do you have for your farm in the future? We hope that when we pass on someone will love and farm it. 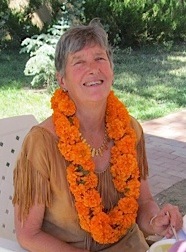 Check out "A visit to Taos' Squash Blossom Farm" from The Taos News.